Here in OK the schools begin their new year in about mid-August. This was always very odd for me because when I was young school never started until AFTER Labor Day. The first couple of years that we lived here, it caught me off guard when they got out of school about the middle of MAY! That was a bit frustrating to me because they were already out of school and we homeschoolers were still plugging away. I quickly realized my error and did some schedule shifting the next year. Because the new school year starts in August, July is school supplies month. I love school supplies. It reminds me of the line from You’ve Got Mail when he says he’d send her a bouquet of freshly sharpened pencils if he knew her name and address. 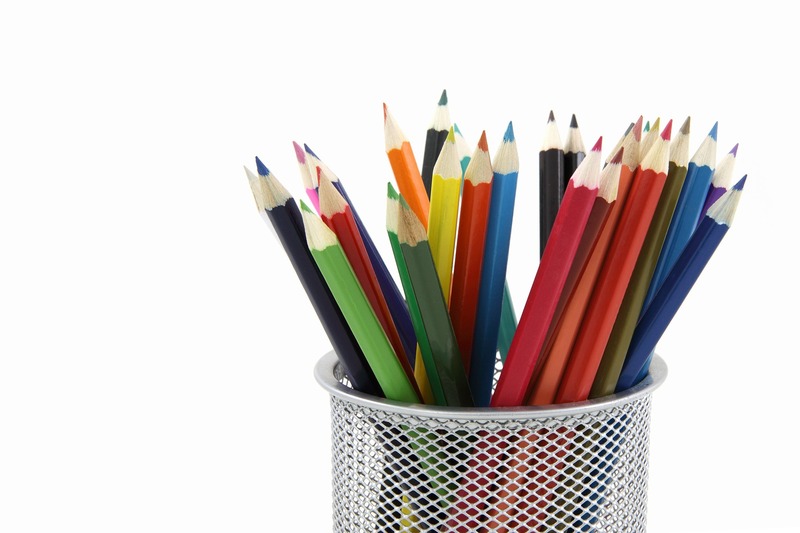 Of course, I’d send sharpened colored pencils since they’d be prettier. At any rate, now is the time to watch the sales and stock up on pencils, pens, paper, glue, and pocket portfolios. Years ago I got such a good deal on spiral notebooks, I think they were just 17¢ each, that I’m still working through my stockpile of them. But I need to go through my stash and see if there is anything I do need to purchase. I bought some tracing paper today. Sadly, it was NOT on sale and there was only one brand. It wasn’t even in the school supplies aisle but in the coloring craft aisle. I even asked an employee working in the area if they had any and she didn’t know of any at all. I need it for working on some lettering styles. I supposed to place the tracing paper over the page in my book and practice that way because I can then see through the paper and work on forming my letters. Some of the items I stock up on are the yellowish-orange disposable mechanical pencils, papermate colored pens, paper of different types, notebooks, tape, and glue. I used to stock up on index cards and sticky notes and sticky flags. But I use my bullet journal for that now. What do you stock up on? Of course, looking over any new curricula you intend to use is a vital step in preparation. Sometimes they suggest using specific office type supplies. Be sure to take a look at those recommendations now while things are on sale and save yourself some money. You might also think about what you can do to celebrate your first day back at “school.” (I’ll share some ideas in the coming weeks for first day ideas.) Will you jump in all subjects right away or ease back in slowly, one subject at a time? Well, keep your eyes peeled for those wonderful deals.